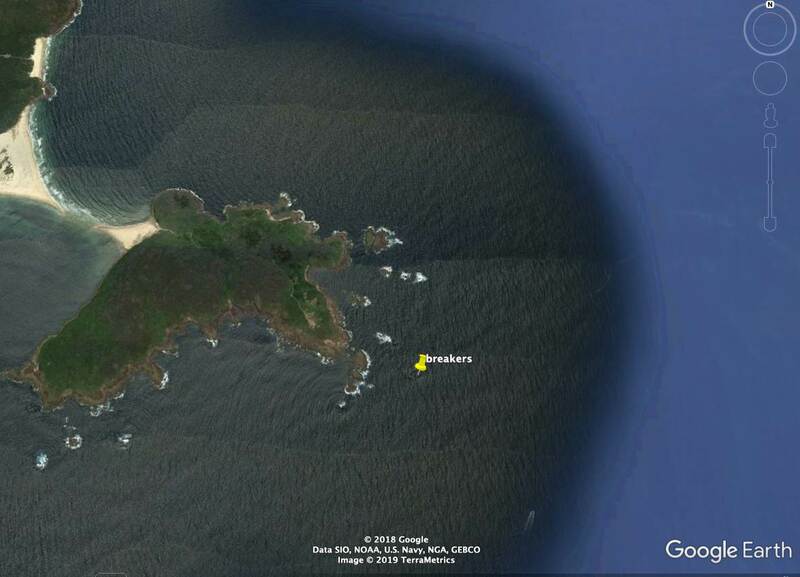 On google maps I find Fingal Spit, Bay, Head and Point but no Island. Is it actually Shark Island? 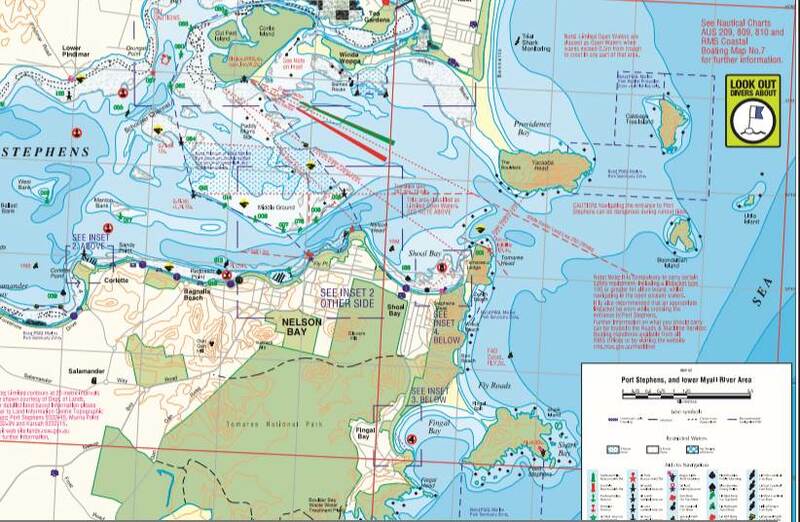 I went into Port Stephens a couple of years ago approaching from south and remember reading in one of the guide books to be wary of mistaking the coastal feature there for the entry to Port Stephens. Thankfully they are all safe and well but it must have been a terrifying experience. "It's believed the yacht may have been struck by a Bombora off Fingal Island." At the end of fingal spit. Another case of not enough searoom? I left Port Stephens yesterday afternoon and there was a pretty decent swell running, it wouldn't have been much fun out there after dark. Wouldn't have been going anywhere near the point in those conditions but can't comment without knowing what happened, could have been an equipment failure or anything. That was my initial thought also Cisco, it is a little confusing at distance in daylight when approaching from the south, but at night with a lighthouse right there, who knows what happened? ?, cutting the corner too fine around Shark Island, there are lots of rocks around there to be careful of. Your the man on the spot FC, re the swell, not much swell here a further 70nm north yesterday, but it has picked up a little overnight. You planning to stop in at the Camden Haven, Future? It was on the way back down after a front that came through Tues night but still some good ones coming through around 11.30 when I came out, though it does seem to get a little confused around the Port entrance there which probably made it a bit worse. Not much of anything out here today though. Not quite sure where I'll stop tonight, high tide on most of the bars is around 1 which won't really work for me as I'm only just about to pass Seal Rocks, so thinking I might duck into Forster and if I do that will probably skip Camden tomorrow and head further north. But dunno yet, it's pretty quiet out here so will see what happens! FC, Seas are as flat as they get here (near Laurieton) at the moment, wind about 4knts ESE. Most bars on the Nth coast have an over-run, Camden Haven is two and a half hrs (same as Swansea). That's 2.5 hrs after Fort Denison high. Forster I think is about 2hrs, Port Mac about an hour or so. Yamba about 2.5hrs . Crowdy Harbour is excellent to rest without worrying about tides, give Forde rock a wide berth(the current can push you onto it) tie up to the newish jetty, with a fender board, or in one of the trawler berths. Could this have been a yacht that was the subject of discussion on this forum in the past couple of months? I recall some discussion of a accident going somewhere to happen. Thanks for the tips BlueMoon, no wind and slow going so did end up coming into Tuncurry today, it's a nice spot. Doesn't look like any of the bars will be doing too much the next few days with this forecast so will see how I go, hoping for a bit more breeze tomorrow and if so might head for Port Macquarie or Hat Head. Yep cheers, it's on my list, had it as a possible anchorage for some sleep later tonight but would probably need a bit more wind to get that far today. Hat Head might be a bit more achievable but depends on the weather as always. Don't mind the ocean anchorages in the right conditions. One wonders about a lee shore , surely they had a chart on board at least, I did read that the boat was valued @ 12k, any idea what type, construction she was, will be interested to see how salvage/ recovery pans out, at home for a rest, Talei on swing mooring at Marks point marina, lake Mac, great little marina. 40 foot and valued at 12 grand, I would guess steel or ferro. Either is going to be very difficult to salvage. Could have been an old timber boat. steel generally bounces over rocks unless its been severely neglected. The breakers off Point Stephens are a big risk to boats. They are about 230m off shore and in relatively deep water and jump right out at you as you come around Fingal in a relaxed mood on you final approach to the entrance to the port. Well maybe that's just my flimsy excuse for a close call, but heaps of boats have come to grief there. A few years ago a steel boat got tossed on the reef there and sunk after punting its keel up into the cabin. I definitely recommend staying well away from Fingal in any weather night or day. That's like Telegraph Rock off Camden Head. Same here! Your nous is going to keep you alive and well on your trip ! (The scribbler of the news report of the bombora's intransigence promoting a marine resque deserves a Pulitzer price! I grew up at Nelson Bay, many times a boat would round Fingal Is and see the lights of the houses back in Fingal Bay, thinking they were running into Shoal Bay only to run aground on the spit. Craig, I can see how that could happen, I've been into pt Stephens from the north and south both at night and either way you need to be very cautious and very confident of your navigation, otherwise stand off and wait for day light. Lead lights are great, take you in on the north side, visible day and night, but you need to know where and what to look for as they are way back inside the harbour, they are solid red / green lights with a solid white light in the middle of the lead.